I love color, especially Teal! 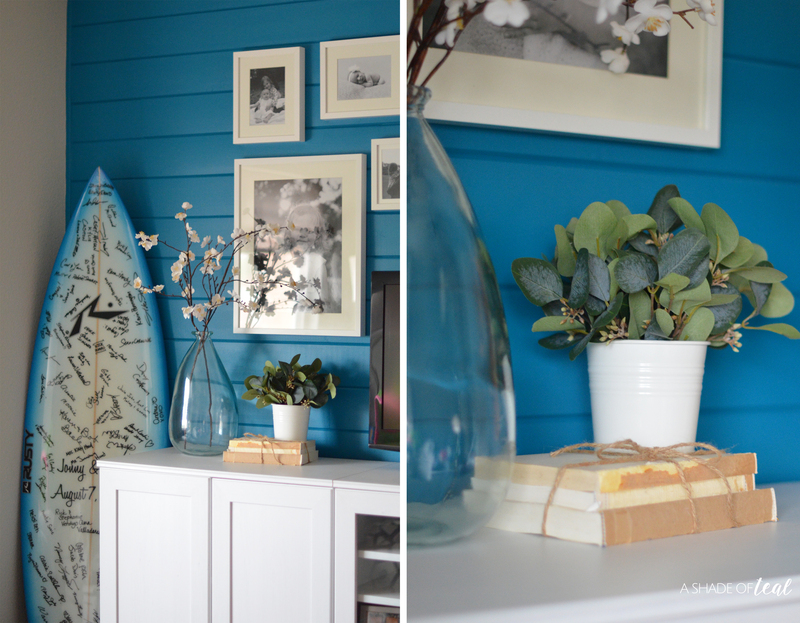 One thing I have always wanted is a Teal accent feature wall. 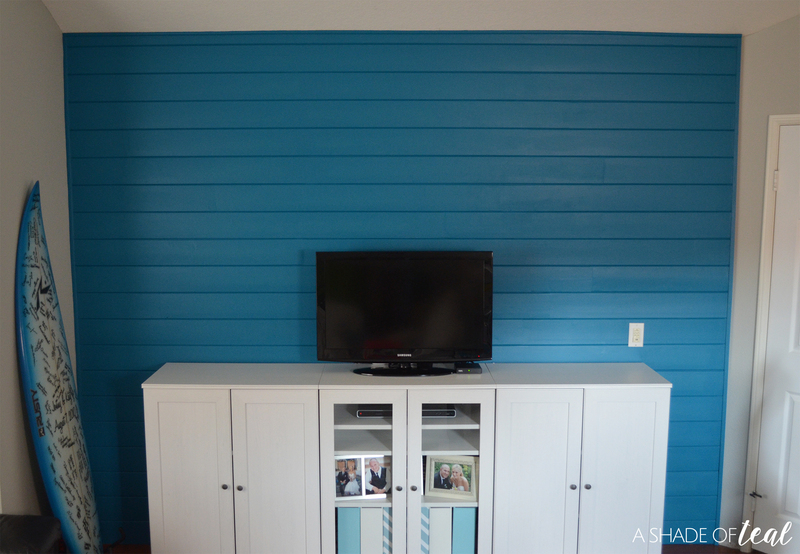 Well, I finally made it happen by updating my Shiplap feature wall in my bonus room! My Bonus room has been a space that has never been completed; finally finishing this wall has me motivated to complete the space. We use the room as a playroom, a TV room, my craft storage room, and if need be a guest room. 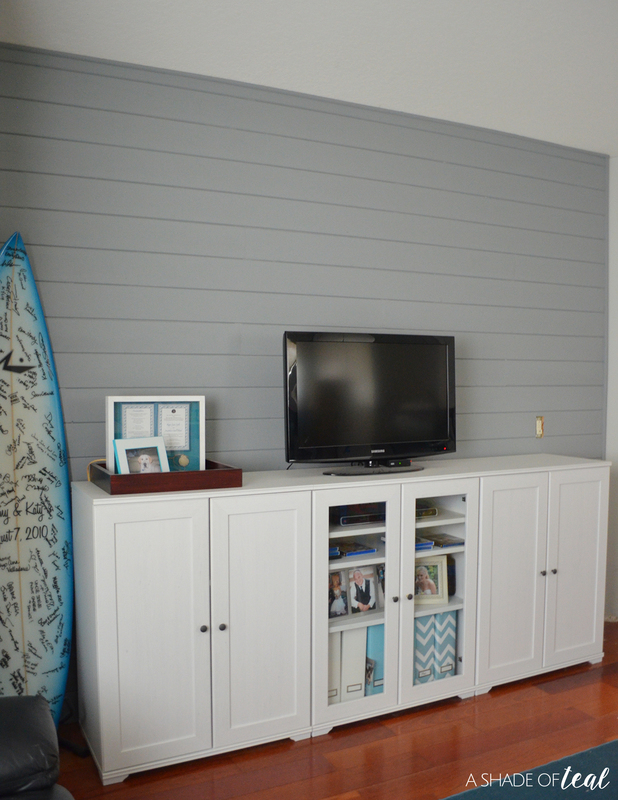 Since we moved in I have painted all the walls a light grey then installed a shiplap feature wall behind our TV. 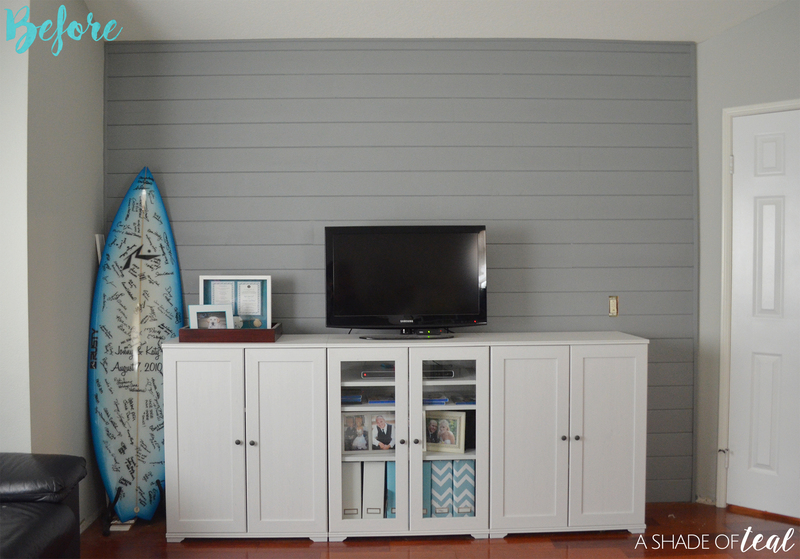 I originally painted the shiplap wall a dark grey, but I honestly never loved it. 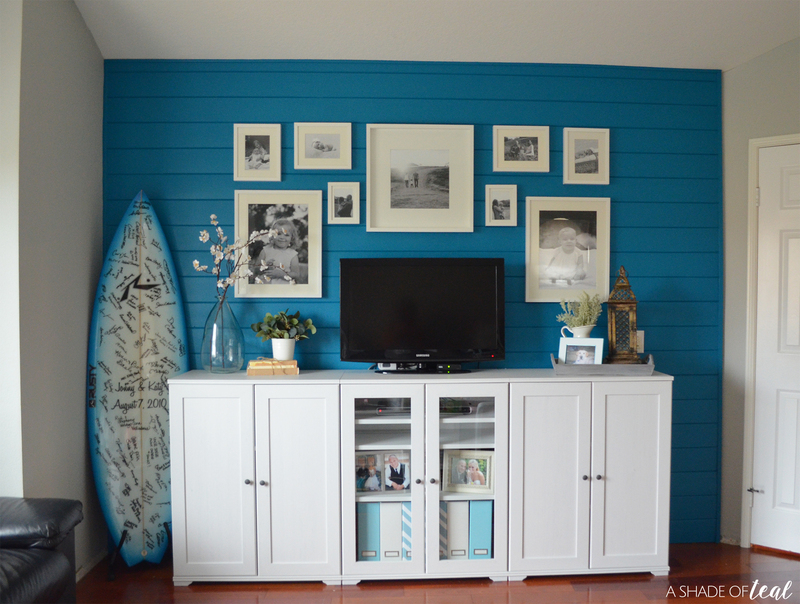 This room was in desperate need of some color, and what better color than Teal! 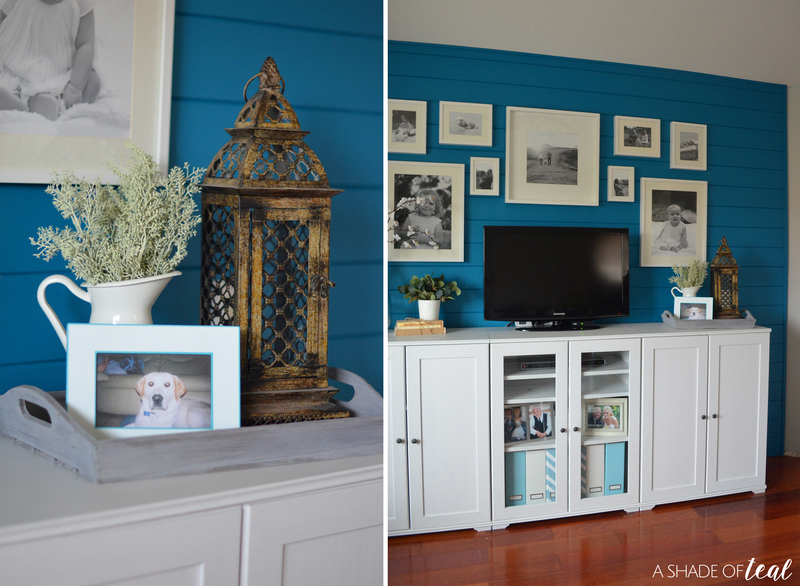 For the color I went with Blue Nile (HGSW1331) a color from one of the HGTV HOME™ by Sherwin-Williams 2018 Color Collections of the Year, Next Journey. 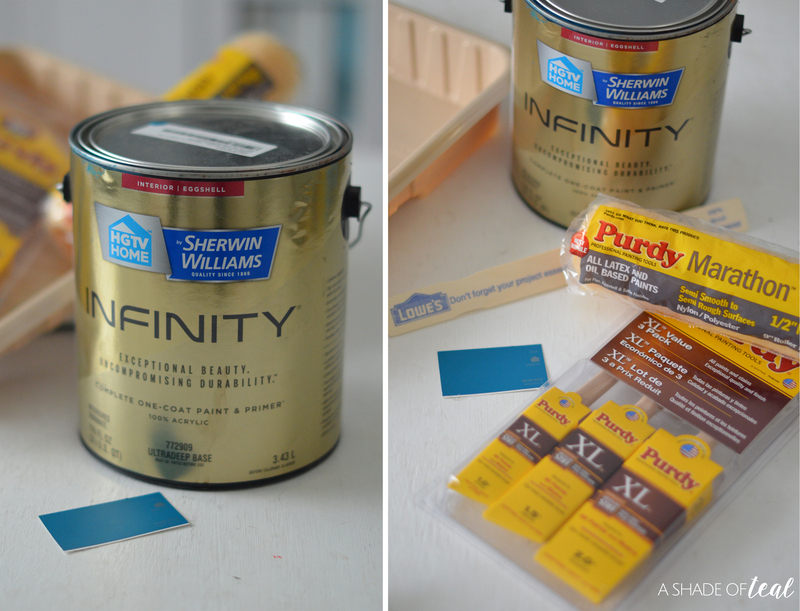 You can find HGTV HOME™ by Sherwin-Williams INFINITY Interior Paint and Primer at Lowe’s. With four on-trend Color Collections of the Year from HGTV HOME™ by Sherwin-Williams, it’s easier than ever to bring harmony to your home. Each Color Collection has a range of colors that go together in any combination, helping take the guesswork out of choosing color and giving your home a sense of room-to-room harmony. You’ll love the color options! I know I did, and I love how it pulled my space together. Blue Nile (HGSW1331) is a perfect rich teal color, not too bright and not too dark. You can take the guesswork and frustration out of coordinating colors in your home by using one of the HGTV HOME™ by Sherwin-Williams new 2018 Color Collections of the Year. I got started right away and started painting with my Purdy brushes and rollers. 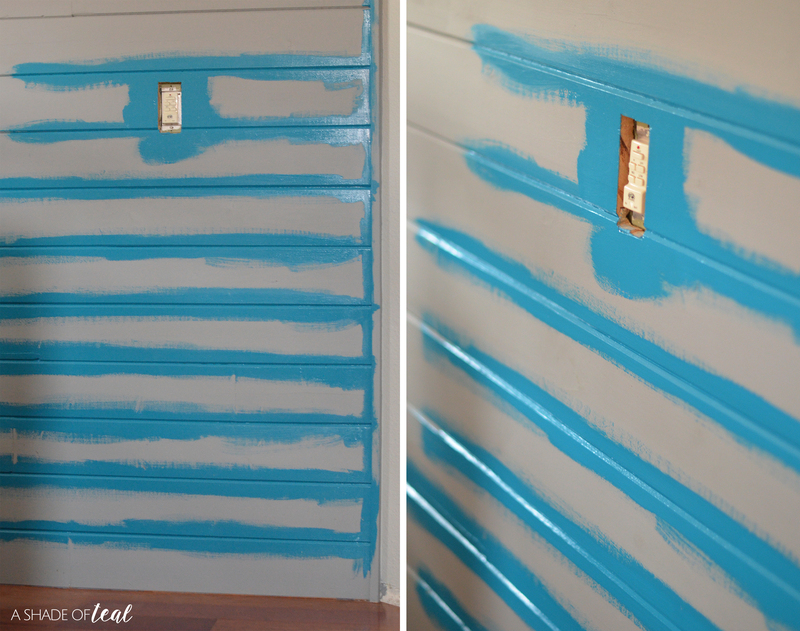 First, I painted all the shiplap seams & cut the edges with a brush. Then I went back and rolled the rest. This wall is large but it only took 1 1/2 hours to completely paint. After everything was dry I moved my furniture back in place and I was ready to decorate. I decided to add a simple photo gallery wall using all white frames with black & white pictures. 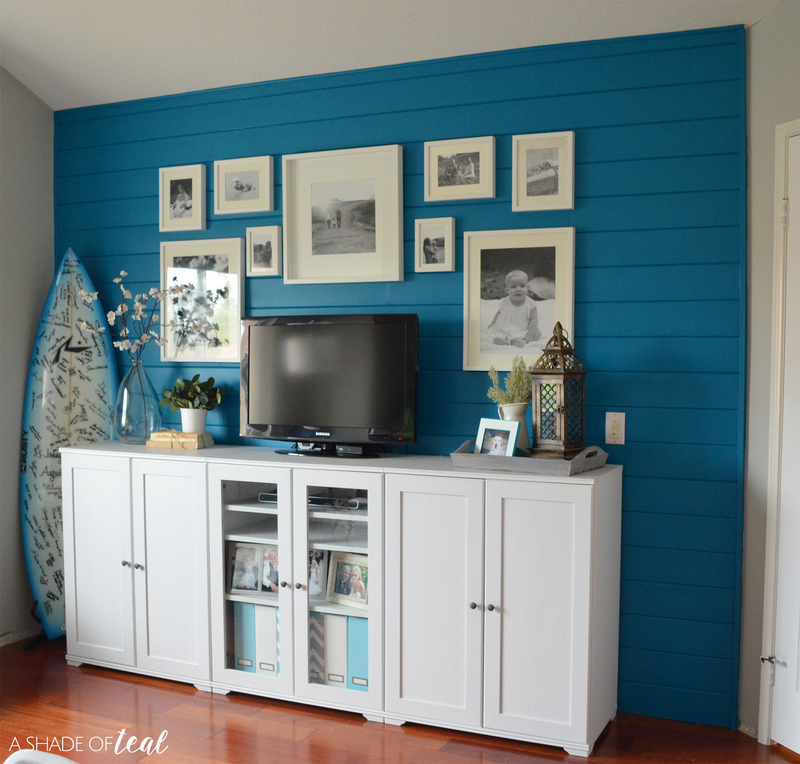 I love how the frames pop off the Teal wall! Now for some after pictures. The color couldn’t be more perfect! 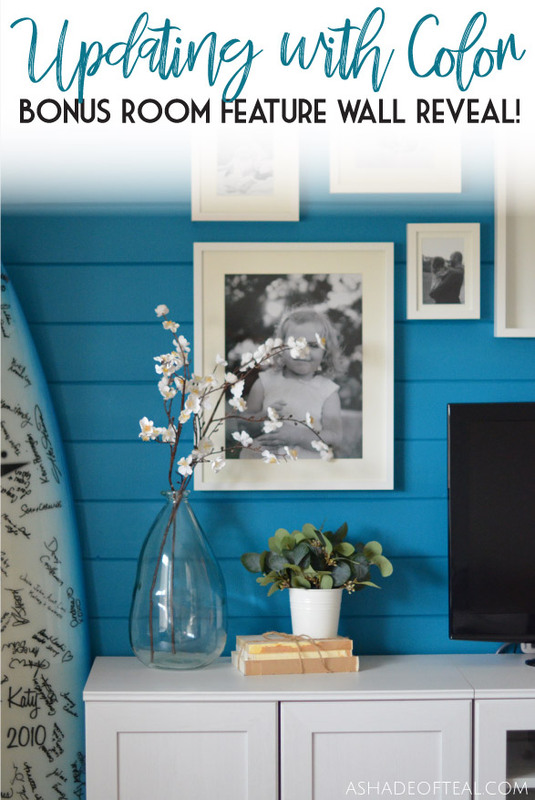 I absolutely love Blue Nile (HGSW1331) a color from Next Journey Color Collection, one of the HGTV HOME™ by Sherwin-Williams 2018 Color Collections of the Year! 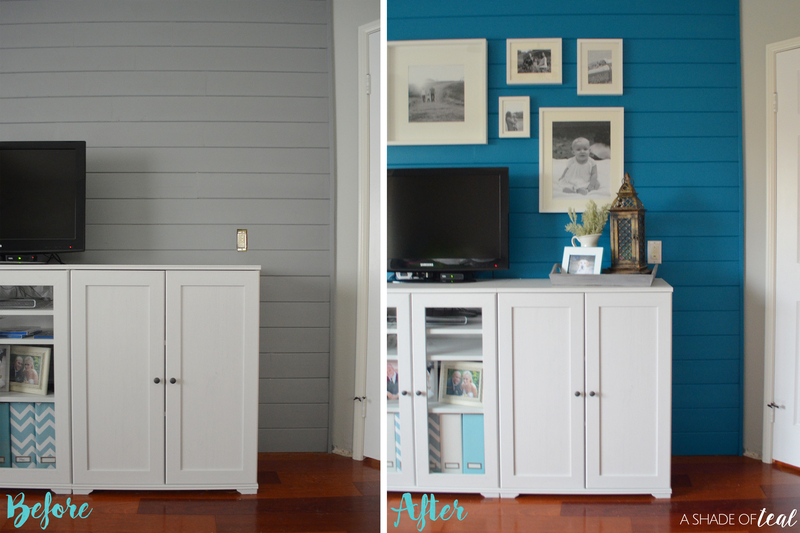 The before and after are pretty drastic, and it makes the room feel sophisticated even though it’s mainly a playroom. 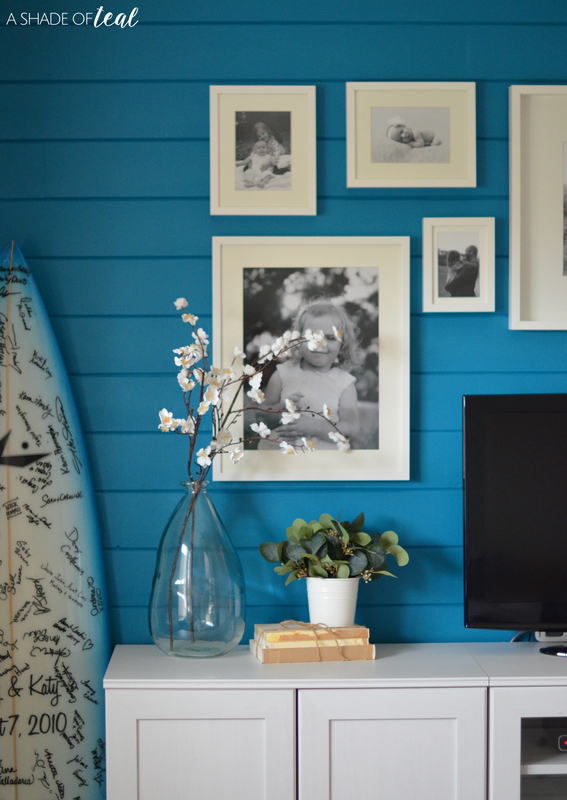 So if you’re looking to update a room, or even your whole home, go check out 2018 Color Collections of the Year by HGTV HOME™ by Sherwin-Williams INFINITY Interior Paint and Primer. « Happy, Healthy Baby! Foundation of Life-Long Health.